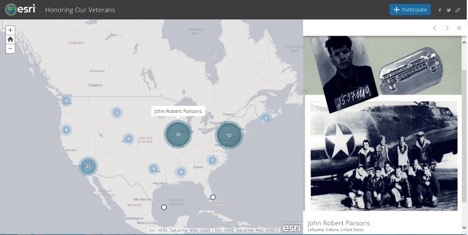 Esri is honoring Veterans Day this year with two Story Maps that both show the unique lives of the brave men and women who have defended the United States. The Mary Edwards Walker Story Map tells the amazing story of the first and only female Medal of Honor recipient. Born in Oswego, New York in 1832 to a family of iconoclastic egalitarians, Walker was the second woman to graduate from medical school in the United States, and founded her own medical practice shortly upon graduating. Soon after however, the Civil War started, and Walker—a staunch abolitionist—volunteered for the Union Army as a nurse, eventually becoming the US Army’s first female surgeon. After four years of battlefront service, Dr. Mary Walker was awarded the Medal of Honor, the United States of America’s highest military honor. 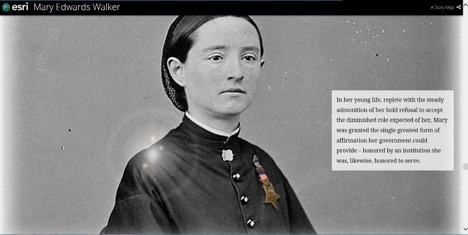 See Esri’s Story Map of America’s first and only female Medal of Honor recipient: Mary Edwards Walker. The Honoring Our Veterans Story Map is a crowdsourced tool that invites people to contribute photos and descriptions, thanking family members who served in the military. Visitors can view an interactive global map to see where veterans who served are living now. Also visible are stories from their experiences serving, as well as links to veterans’ personal online media such as autobiographies, blogs, and websites. On Veterans Day, we celebrate those who have served in the United States Armed Forces. Esri is proud to employ and work with many people who have done this country the honor of serving in the military. We are happy and honored to bring visibility to the service and sacrifice that every veteran has given. See the many stories of those who have served across the United States on the Honoring Our Veterans Story Map.